This Christmas when you order Cheapskates Club gift memberships, you'll pay just $25 each! That's a saving of 30% off the regular price when you buy these limited time only gift memberships. 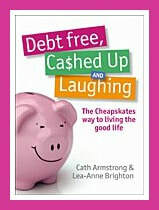 Debt Free, Cashed Up and Laughing will teach you how to save money on everyday household items with handy practical hints and tips. It will show you how to pay off your credit card and any outstanding debts and begin to save money so that you can enjoy a fun-filled life with no more financial anxiety. Savings can be made in every single area of your life and literally thousands of dollars can be saved depending on the hints and tips you choose to follow. ​A follow-up to the bestselling DEBT-FREE, CASHED-UP AND LAUGHING from renowned queen of thrift, Cath Armstrong, this month-by month guide will show you how to ditch debt and stockpile cash, all year round. In the current economic climate many Australians are on a suddenly limited budget. 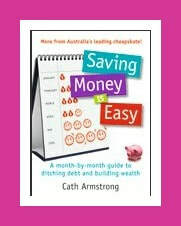 In SAVING MONEY IS EASY, Cath gives us a month-by-month guide to organising your finances in hard times and shows how the average family can save literally thousands of dollars by taking charge of their money, budget planning, and benefiting from the mass of tips, case histories, recipes and how-to’s that this book has to offer. Feed four people for $80.00 a week and slash thousands from your grocery bill! In the current economic climate many Australians are on a limited budget. 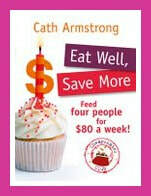 In Eat Well, Save More thrift queen Cath Armstrong demonstrates how you can feed four people with healthy, delicious food for only $80.00 per week. Full of clever strategies, tips and tricks, Eat Well, Save More also gives you 100 easy recipes to help you make nutritious cost-effective meals for a fraction of the cost of your usual grocery bill.